Todoist is a popular todo app that has been around for several years now. 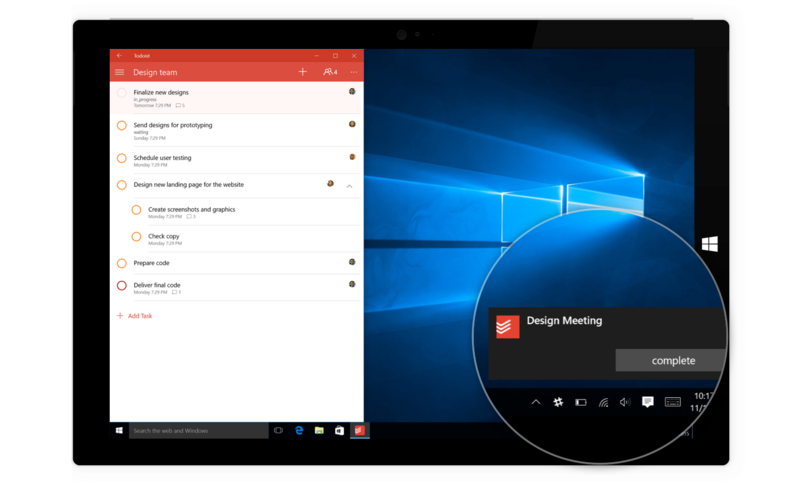 A todoist app has been available across several platforms including a Windows desktop app. Windows Phone users however were always missing an official version for their platform. Taskcrunch was a wonderful unofficial app that was developed by developer Jan Kratochvil. That app and the developer were acquired by Todoist a few months ago and the new Todoist app for Windows is a result of this collaboration. The result is a true Windows 10 app that aims to look and feel like one that has been built from ground up for the platform. Todoist for Windows 10 will be our first ever native desktop app – that means faster performance, seamless offline support, complete compatibility with your touch screen computers, and a Todoist look-and-feel that’s optimized for Windows. And of course, your to-do lists will be deeply integrated with all your favorite Windows 10 features. Today, we’re launching the Preview with customizable Live Tiles and actionable notifications with Cortana integration soon to come. Todoist for Windows 10 will be our first ever platform to support a 3-pane view. This means your group discussions will always be in context with a side-by-side overview of your projects, tasks, comments, and attached files. The 3-pane view makes it easier than ever to collaborate with coworkers, family members, and friends while moving your important projects forward in Todoist for Windows. Get notified of upcoming tasks and never forget another important deadline. Our brand-new, interactive notifications allow you to receive and complete task reminders without ever entering the Todoist app. The app is currently in preview for Windows 10 with a Windows 10 Mobile version expected soon. Get the app from the link below.